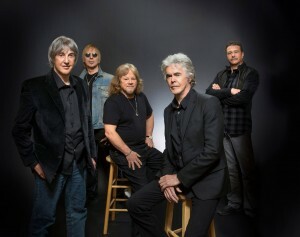 Three Dog Night will play at the Admiral Theatre on March 25, the venue announced this morning. The venerable band’s concert scheduled for next Friday, Oct. 2 at the Admiral had to be postponed after co-frontman and co-founder Cory Wells (at left in the photo, with [from second left] Paul Kingery, Michael Allsup, Danny Hutton and Pat Bautz) suffered back problems that required treatment and rest. The Admiral said that tickets for the Oct. 2 concert will be honored on March 25. Ticketholders who are unable to attend on that date should contact the box office at 360-373-6743 for a full refund. The Oct. 2 concert was a sell-out. The band initially cancelled a date on Labor Day weekend, allowing Wells to receive medical attention. Further action has been deemed necessary by Wells’ doctors, however. The Three Dog Night concert scheduled for next Friday, Oct. 2 at the Admiral Theatre has been postponed by the band while co-frontman and co-founder Cory Wells (at left in the photo, with [from second left] Paul Kingery, Michael Allsup, Danny Hutton and Pat Bautz) receives treatment for a back problem. According to a release, the Admiral is working with the band’s management to schedule a new date and we will share details via email, letter, social media and our Web site as soon as they becom e available. The concert — the Admiral’s 2015-16 season-opener — was a sell-out. The Admiral said it hopes to have news about a rescheduled appearance within a week. The Admiral Theatre has inked over a couple of penciled-in additions to their 2012-13 subscription season, both of which were tentatively announced a couple of weeks ago: Three Dog Night and Wilson Phillips. Three Dog Night, one of the biggest hit-making bands of the 1970s, will appear in early June. The band, with two of its original three-vocalist lineup (Danny Hutton and Cory Wells) leading the way, headlined the Kitsap County Fair and Stampede several years ago (when the fair experimented for a few years with bigger-name attractions, including TDN, Grand Funk and Eddie Money), and tore the joint up. Wilson Phillips were pop darlings in the 1990s, the daughters of music icons Brian Wilson (the Beach Boys) and John and Michelle Phillips (the Mamas and the Papas). Tickets for the 2012-13 season go on sale July 2. More information is available from the Admiral, 360-373-6743, admiraltheatre.org.